Last week I found my yoga, zumba & Muay Thai classes missing on schedule an entire evening – not wanting to do anything in the gym that was not musically oriented, I set out art gallery hopping so my creative side gets a dose of eye candy (not male related for once). The most delightful exhibition, being a super sensuous chick that I am was Hend El Falafly’s exhibition at Art Sawa. Hend, an Egyptian who lives and works in Cairo was sweetness and light personified and it was my luck that she was at the gallery at the time of my visit. Over some nuts and dried apricots with fruit cocktails, we got chatting and it was interesting to marry her persona to the paintings I was so overwhelmed by on the walls. Hend explains that realism at times worries her and she wants to express that through her work. Being inquisitive, I dig deeper and it is clear that her work has a symbolic and very expressive meaning behind it. Being a woman and despite my tomboy tendencies, I was moved by each of her sexily sensuous pieces. Hend explores through her intimate works in ”Senses and Sensibilities” the different emotions expressed by women, usually which are part of her everyday life. She uses body language to understand the meaningful silence carried over by their experiences and stories. These are reflected in all its semantic in the facial expressions and movements of the hands, the feet, the look ,the clothes and emotions repressed. And with the silence of the lips, it is usually the eyes which transcends all the languages and spoken in a glance, an unspeakable tongue that denies lies and hypocrisies. I agree with this fully as I’m always told that no matter what I am thinking or feeling, my eyes always betray what I really feel and are the windows to my soul….its not always a good thing but over the years I’ve learnt that my eyes betray me and if it reflects sadness at any time, I end up crying because I know the person across me knows I’m hurting….its not nice for the other person but hey….I’m a woman and I can do what I feel like. Hend tells me that an array of different areas of reality inspires her and have great impact on her works, which is revealed through incredible movement and light. 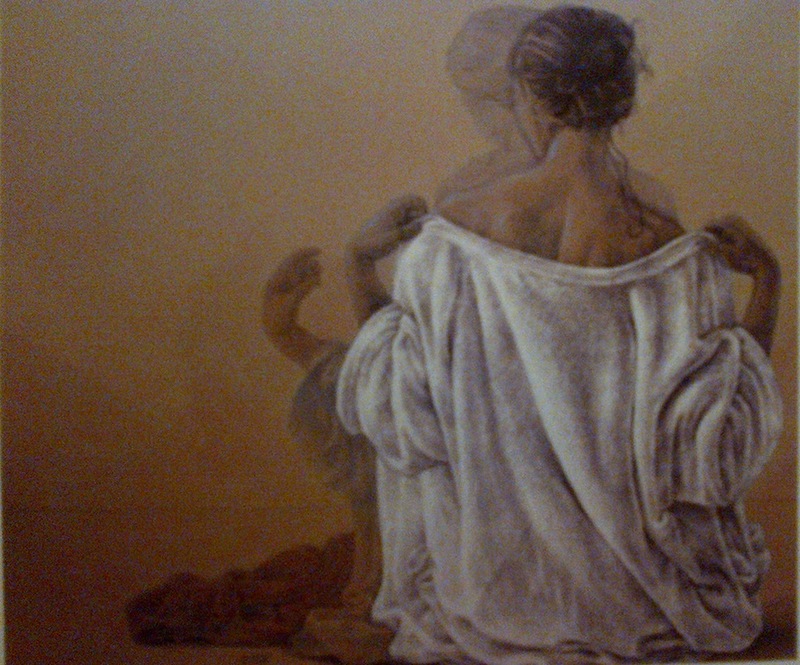 No secret can be kept hidden……if you want to see her amazing work for yourself, its at DIFC Art Sawa until 19th June. Enjoy!